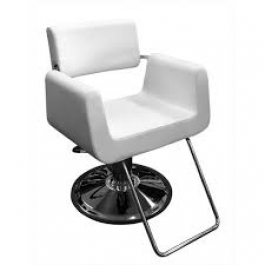 This simple, yet elegant styling chair with curved black arms and T-shaped chrome foot rest and base is sleek and exceptionally well designed and comfortable. The soft PVC vinyl upholstery covers dense foam cushions that will last for years. The clean lines will fit in with any salon décor and make this styling chair easy to keep clean and beautiful. * Heavy Duty Round Base * Styling chair rotates 360 degrees * Matching Shampoo Unit available * 400 lb seating capacity * Outside Arm to Arm: 26.5" * Seat DIM: 19.5" W x 18" D * Height adjustment: 20" to 25.5"